So what does it take to live life on a sailboat while bringing up two kids? 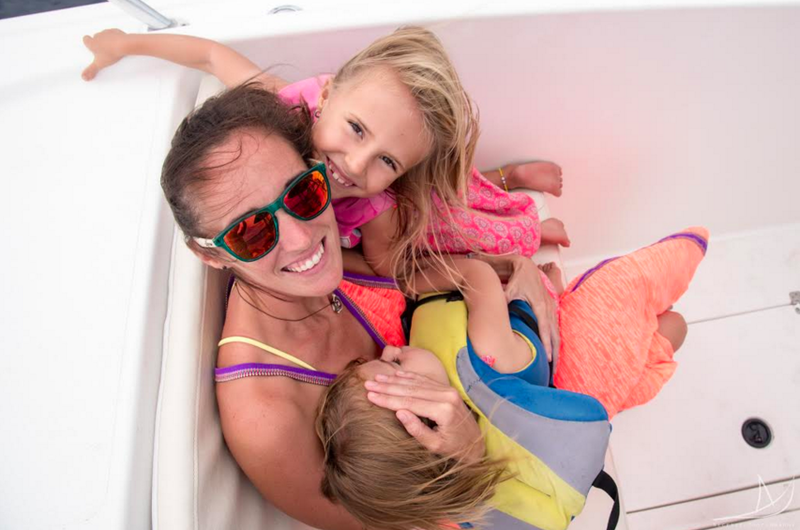 Our guest blogger Genevieve of the popular sailing blog, It’s a Necessity, shares her experiences from raising two kids while travelling the world on their floating home. 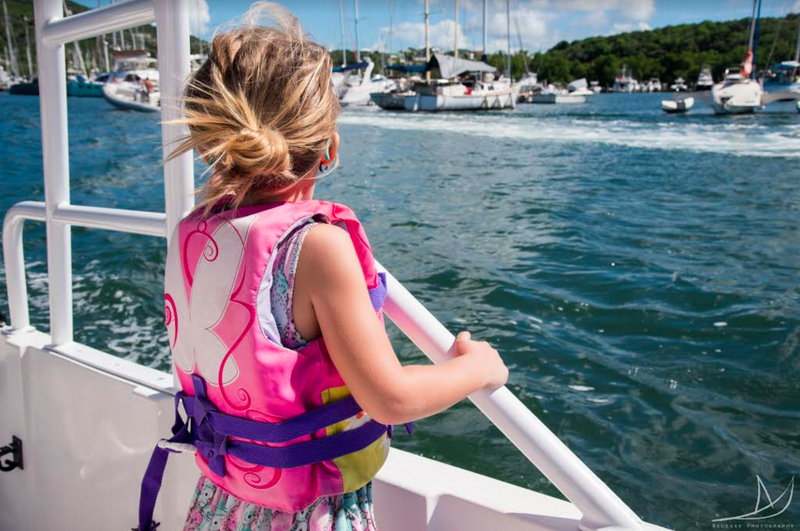 From picking the right lifejacket to homeschooling, read Genevieve’s tips for how to survive boating with kids. Genevieve and her two first mates, Arias and Ellia. I vividly remember starring down at the water coming up over our toe rail, unexpectedly heeled way too far for comfort, with the only thing holding our 1 year old from the waves below being the motherly death grip I had on her. This is something I will NEVER forget, and something that taught us more in the ways of parenting and sailing than we ever wished to learn. In the past we have been accused of being selfish parents. Of forcing our kids into a lifestyle that is not meant for children. Of intentionally putting our youngins in harms way. Of keeping them cooped up when all they need is space to run. Of taking them away from the social aspects of life that are meant to turn them into productive members of society. FYI, taking your kids out of the “usual” may bring outsiders’ judgement on you. I try and not pay attention to the trolls; to the unknowing opinions that get thrown our way because we live our lives in a very open and public way. I tell myself, they have no idea what they are talking about, they are clearly uniformed, jealous, and biased. I do my best to turn the other cheek and not engage in a verbal war cloaked by a computer screen. But if I take away the hurt (and instigations) that they are trying to cause, and look at just their words, I do agree with some of it. Some of what they are typing rings true. If not done properly, raising kids “alternatively”, can be harmful to them. Raising them to the “norm” can also be harmful. Raising kids, period, is a challenge!!! I am no parenting guru. We don’t necessarily have it “right” or “in the bag”, but we think what we are doing is definitely working for us. Since starting sailing all those years ago, not only were we newbies to sailing but we were newbies to parenting as well. The main benefit we had to RAISING KIDS ON A SAILBOAT, was just that, we were newbies at both. We didn’t know any different, had never done it any other way, so we learned what worked and what didn’t all while living on our boat. The boat was our norm. We have learned a few tricks along the way on SURVIVING LIFE ON A SAILBOAT WITH KIDS so that we don’t fall pray to what those opinionated trolls have accused us of. Most of the tricks boil down to Safety, Sanity, Schooling, and Space. These lifestyle tips could come in handy whether your parenting is alternative or not, whether you’re a newbie or not, and whether you are a parent or not. Aren’t you afraid that your kid is going to fall off the boat? Well yes, that is always a fear. Just like how any kid could step out on to a street in front of a passing car. But you hope that the rules you have instilled in your children, and the constant verbal repetition of them, will stop them from stepping into harms way (road or ocean). There are also extra precautions that can be taken. Lifeline netting. If your kids are constantly on the move, love to play around the edge of the boat, or if you just want that extra peace of mind, you can turn the deck of your boat into one extremely large playpen. An extra bonus of putting up this netting is that it can not only stop small children from falling off the boat, but it may also catch fly-away toys, clothes that are drying “on the line”, or anything else trying to escape your ship. If you’re still nervous about your kid near the water, there are lifejackets. Some kids may not be super keen on wearing them but there are a plethora of different kinds out there, and maybe one type will appeal to your child more than another. Our girls had West Marine ones when they were small and couldn’t care less, and now they have “pretty” west marine ones with fairies on them and a wing design on the back. If your plan is to sail to remote islands, where medical assistance and meds might be hard to come by, then an extensive first aid kit is probably wise. 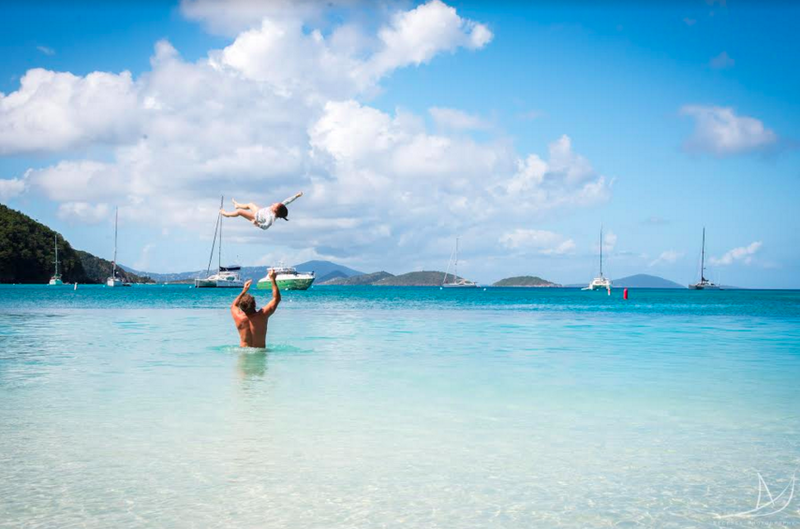 In our Caribbean island hopping experience, we quickly realized that we were way too stocked. Every destination we made it to had the medical supplies we needed, and at a 1/4 of the cost that we had purchased them back home. That overly stocked kit that we had, most of the things in it expired before we ever needed them. But this is very location dependent. Be smart. Lastly, AND MOST IMPORTANTLY, there are rules. Just like in a land home, for safety we have rules. You need to come up with a list of rules regarding boat behaviour that makes you comfortable and keeps you all safe. 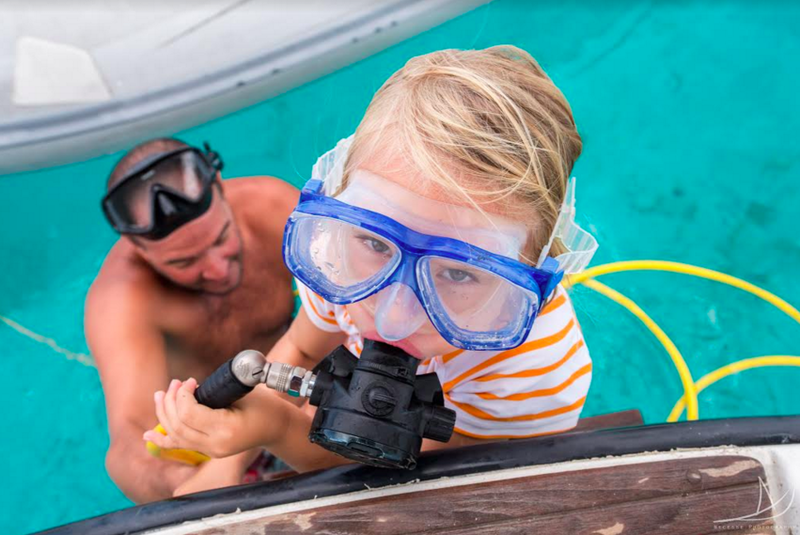 For example, our kids’ boat rules are: 1) you must ask permission before going outside of the boat. 2) there must be an adult present for you to go on deck. 3) while underway you may walk around the cockpit while holding on to something or someone; no walking on the upper cushions! 4) while in the dinghy you keep your feet on the floor and you hold on to a handle. THIS IS CRUCIAL: to survive life on a sailboat, you must take your safety seriously. I’m not suggesting that living on a boat may make you crazy, but having children might! Kids, if un-entertained and left to their own devices, will get bored and then they will turn on you. They may look cute, but they are sneaky and conniving little people. Even the best of them will find a way to muck things up. Stay ahead of their games, and save yourself some serious headaches and self-questioning, by keeping those umpa-loompas busy in a way you approve of. Kids need something to keep those mini-hands busy, good toys, that pack up small, don’t make too much noise, and, if you’re lucky/smart, are educational toys. You also need spots to store all of these goodies. Get them some bins, boxes, cupboards, whatever, but make sure they are easy to access and open and shut (unless you want to constantly be cleaning up their toys). We have the simple rules that “everything has a home” and once you are done playing with it, it goes back to its home. Everyone on the boat needs to understand that for your family to co-exist happily in a smaller home, all should respect each others space and things, and that includes not leaving your crap in everyone else’s way. This may not ring true for everyone, but for many, a clean home is a happy home. Life on a sailboat is slow. When there are no projects on the go often you may find yourself looking for things to fill your time. Why not invest that time in making your kid(s) as smart as can be!? When Arias, our eldest, was a baby we were constantly told by others how smart she was. I attribute A LOT of this to the fact that she had both of her parents with her, 24/7, talking to her constantly, teacher her in frequent spare time, and investing a lot of our live aboard life to her education. Whether it is done “by the books or not”, the education of children should not be taken lightly. Taking them out into the world will give them many life lessons beyond what they would have learned behind a desk, but the basics must not be forgotten either. Reading, writing, arithmetic, social, history, etc etc. That’s on you. We keep our boat well stoked with books. We have school books, reading books, colouring books, activity books, sticker books, we have them all. We have a kindle as well, but I personally don’t think that’s the best way to get a young child learning. Whenever we can we swap out our books with new ones, with other sailing families, island libraries, amazon, donation centres, etc. I love books and can guarantee that when we reach an island, if there is a way for me to get my kids new books, I will find it. Two easy tips. 1) Teach your kids to read early and they will be able to teach themselves a fair bit. 2) Don’t fall into homeschooling guilt. I can guarantee that any stay at home parent would start feeling stir-crazy if they had to stay in the confines of their home, with their kids, for days on end. Same applies to boat families. So whats the solution? Go outside!!! Just because your home is floating on water, doesn’t mean you have to stay stuck inside it, with those overly-energetic little ones, all day long. Go swim, go to the beach, go discover the nearby island, go hike, or even just go play on deck. ON A SAILBOAT YOU HAVE THE OUTSIDE WORLD AS YOUR PLAYGROUND. By getting the kids, and yourself, out into a new space could bring on interactions with locals, tourists, boaters, anyone. Having a conversation with someone other than your 4 year old can be extremely rejuvenating, and, in the end, bring your back to your own space feeling extremely thankful that your tiny home has the ability to constantly bring you to these new locations. At the time I was holding on to her tiny body for dear life, cursing our choice to sail with children, but now that we have a few essential things figured out, I am so thankful that we did it this way. 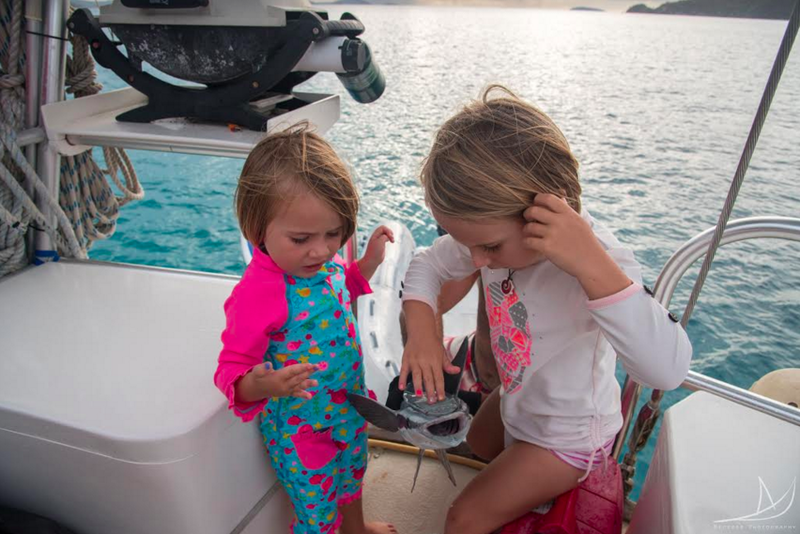 Keep up to date with Genevieve and her crew on her blog, It’s a Necessity and for more tips on family boat holidays, check out our post on sailing with kids.